According to independent analysis by NASA and the National Oceanic and Atmospheric Administration (NOAA), 2018 is yet again an extremely warm year on top of a long-term global warming trend. 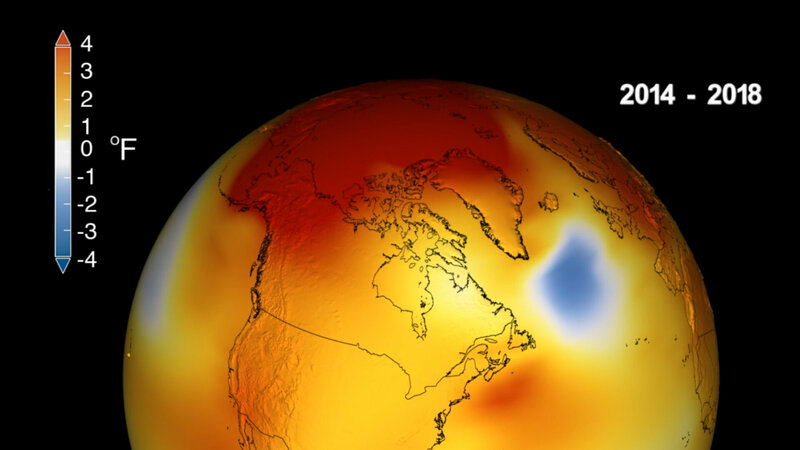 Data from scientists at NASA’s Goddard Institute for Space Studies (GISS) in New York revealed global temperatures in 2018 were 1.5 degrees Fahrenheit (0.83 degrees Celsius) warmer than the 1951 to 1980 mean. According to Gavin Schmidt, director of the NASA Goddard Institute for Space Studies (GISS) in New York, since the 1880s, the average global surface temperature has risen about 2 degrees Fahrenheit (1 degree Celsius). This warming has been driven in large part by increased emissions into the atmosphere of carbon dioxide and other greenhouse gases caused by human activities. “The impacts of long-term global warming are already being felt — in coastal flooding, heat waves, intense precipitation and ecosystem change,” continued to explain Schmidt. Warming trends are strongest in the Arctic region, where 2018 saw the continued loss of sea ice. In addition, mass loss from the Greenland and Antarctic ice sheets continued to contribute to sea level rise. Increasing temperatures can also contribute to longer fire seasons and some extreme weather events.